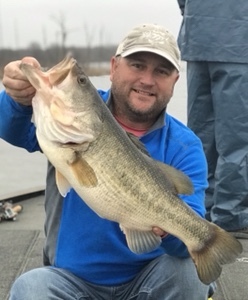 We have had a great start to the early spring fishing here on Lake Fork. Early last week, we experienced a really nice warming trend that saw us with a high of 80 degrees on Wednesday. 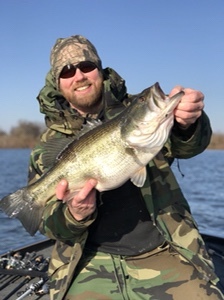 Our water temps on Lake Fork warmed into the low 60s in a few areas, and the fish really responded to it. Unfortunately, we had a pretty big cold front that followed bringing with it a decent amount of cold rain, and the water temp in those areas are back into the 49-50 degree range. Those fish won’t go too far, but they won’t be quite as eager to feed. Best baits will still be chatterbaits, lipless crankbaits, jerkbaits, and jigs. Look for available cover such as lily pad stems, coontail grass, and stumps near creek channels, drains, and ditches. 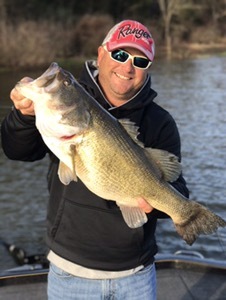 The fish will use these to move in and out of the spawning areas, and they are great places to look for the many BIG, FAT, Lake Fork females that we are famous for. Here are a few pics of recent catches. 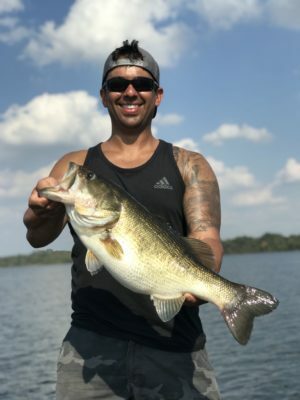 If you are looking for a bass fishing guide on Lake Fork, I would love the opportunity to earn your business. 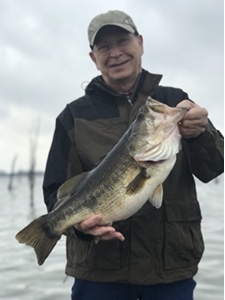 If I don’t have an open date that will work for you, I will happily help you find another great guide on Lake Fork that does. I work with many of the best that Lake Fork has to offer, and we all want to see you have a successful trip. Thank you! 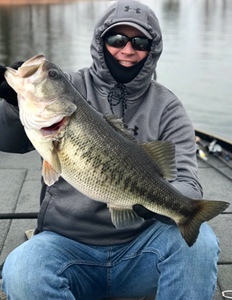 Just a quick update on the conditions here at Lake Fork…..
Water temps have fallen dramatically this week due to the cold weather and rain associated with it. Currents temps range from 53-56 degrees. Current Lake Fork water level is 403.34 (and falling) – about 4″ above normal pool. They have at least one gate open (which is not good for bass fishing on Lake Fork). Water clarity is good on the main lake, and stained to muddy as you go back into most creeks. The bite has been slow. If you are coming, I would have a lipless crankbait, a chatterbait, and a jerk bait tied on. Cover a ton of water. 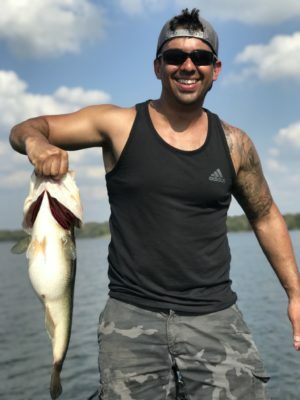 There are some big schools of white bass and yellow bass out on some main lake points and humps and they are feeding. Jigging spoons will load the boat. There are a few bass mixed in with them, but I am struggling to catch many out there. Spoons, tail spinners, Carolina rigs, and drop shots, will get a small handful of bites. 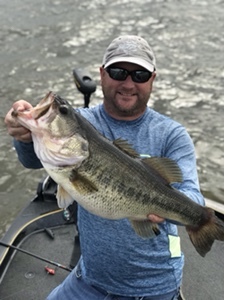 Spring is in full swing here on Lake Fork, and a lot of our bass have made there way to the many shallow spawning flats that Lake Fork has to offer. Water temps are mostly ranging from 59-62 degrees, but warmer water can be found in certain areas. The water is stained to muddy depending on the area, with the water on the north ends and in most major creeks being dirtier than it is down south on the main lake. After the rain we got this past Tuesday and Wednesday, the lake rose a few inches to just under normal pool of 403.0, but the gates have been open, and we are now sitting at 402.84 as of this writing. The bass can be caught on just about anything right now. 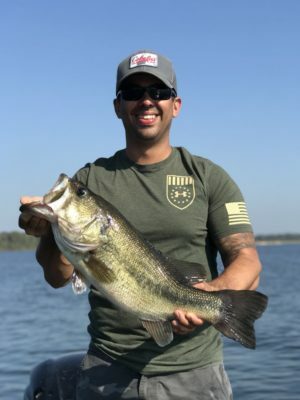 Some of the best choices in the upper ends of the lake are the Strike King Caffeine Shad and Swim’n Caffeine Shad, Lake Fork Hyper Stick, a Santone Spinnerbait, and a Santone Rayburn Swim Jig. 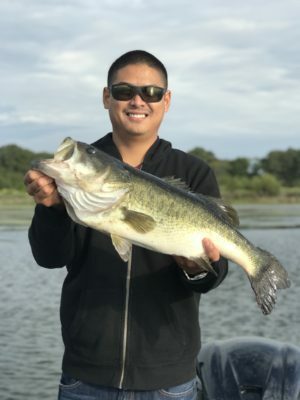 We have caught a BUNCH of big fish this spring on the Santone Rayburn Swim Jig fishing behind others who are throwing a Chatterbait or other bladed jigs. 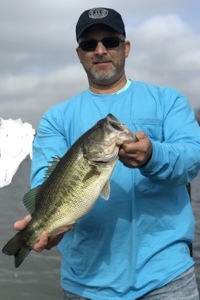 One of the things that separate the Santone swim jig from some other brands is the hook. 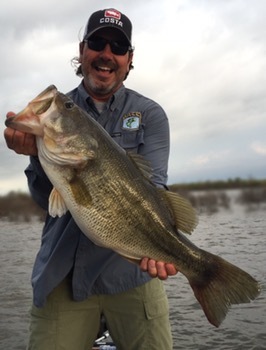 It’s strong and sharp, and that’s what you need when you’re hunting GIANTS on Lake Fork. Mean Green is my “go to” color, and I match it with a Pearl Flash 3.75″ Strike King Rage Swimmer. It’s an awesome combination!!! 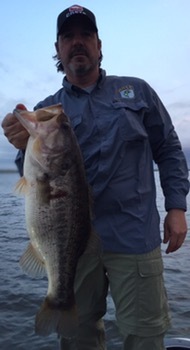 Our big bass of the month was a 10-09 caught by Greg on March 27. She was Greg’s new personal best!!! 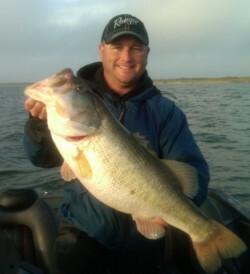 As we move into April, we will have more fish pulling up to spawn, and these baits will continue to produce. If you are coming to Lake Fork, I wish you the best of luck!!! In September of 2016, I had the pleasure of fishing with Conway Bowman and filming an episode of The Outfitters that aired on The Sportsman Channel. Here is that episode!!! 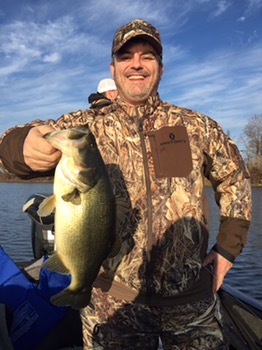 Happy New Year from Lake Fork!!! We had a really good year here on Lake Fork in 2016, and I’m really excited about what’s coming in 2017. My new 2017 Ranger Z521C is in the process of being rigged at Diamond Sports Marine, and I will be picking it very soon to start the breaking in process. If any of you guys are looking for a new Ranger bass boat, give Fred at DSM a call. Those guys will take great care of you like they do me. This year, I have teamed up with Garmin, and I will be using Garmin for all of my marine electronics needs. I have had the opportunity to experiment with some of their units, and I am very excited to begin getting them set up like I want them in my new Ranger boat. One of the technololgies that sets Garmin apart from the others is called Panoptix. According to Garmin, “Panoptix™ all-seeing sonar is the most unique and innovative sonar on the water. Available exclusively from Garmin, it gives you the ability to see fish swimming, see your lure, even see fish attack your lure — and see it all live and in real time. It even shows you 3-D images of fish and structure around your boat.” I’ve seen it in live action, and it is a game changer!!! 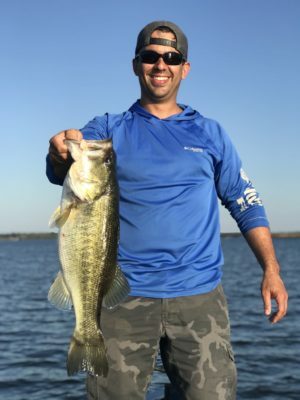 Garmin also makes some really cool action cameras like the Garmin VIRB Ultra 30 that link up with my Garmin units, so I will be bringing you some footage from time to time of our catches and also some helpful tips. Be sure and look for that in 2017. 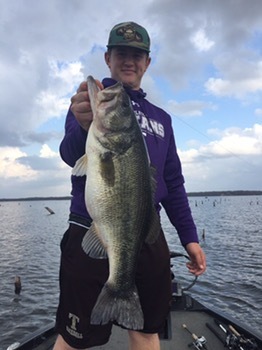 The fishing on Lake Fork this past week was very good. 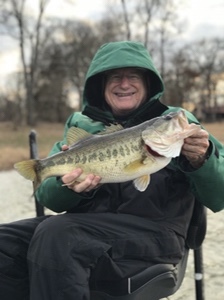 I don’t remember ever catching the numbers of fish in December that we caught this week. 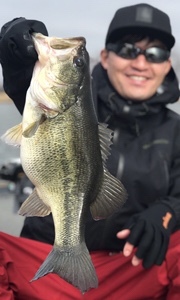 The highlight of the week came first thing Thursday morning when we caught a 10-04 within the first few minutes of the trip. The water temps started at 53 degrees on Monday, rose to 60 by the end of the day on Tuesday, and fell back to 53 by Friday morning. The water level on Lake Fork is sitting at 400.4′ at the time of this writing. Normal pool is 403.0′, so we are about 3 ft low as we move into the new year. Friday was easily our toughest day as we were only able to boat 8 fish in a 7 hour trip. Thursday was our best day for size and numbers and we finished with 21. We had 17 by lunchtime that day, which is incredible for December. My top producing bait for the week was a 1/2 oz Strike King Red Eyed Shad. 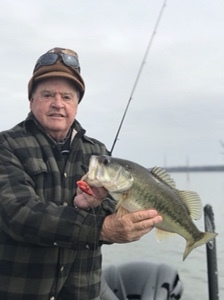 Red was the only color we threw, which is not unusual on Lake Fork during the winter months. 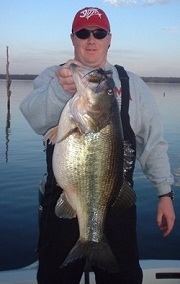 We also threw a white vibrating jig with a Lake Fork Trophy Lures Live Magic Shad as a trailer. This is big player for us for much of the year, and the Live Magic Shad is a “must have” for me. In the cold months, I use the 4.5″ Live Magic Shad, and when the water warms up, I will switch to the 3.5″. 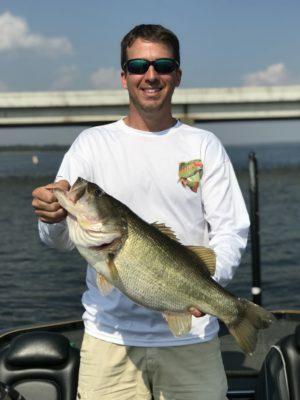 I like the bigger, bulkier profile that the 4.5″ LMS gives me, and it will produce some of our biggest bites of the year. Overall, 2016 was a good year. The water level stayed high enough this spring to keep water in the bushes. This gave the bass fry plenty of cover to hide in and around, and made for a very successful spawn. As a result, our numbers are up from a couple of years ago, and the future is bright for Lake Fork!!! 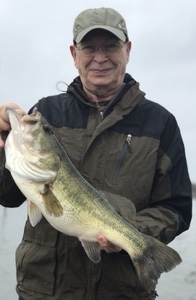 The local power plant lakes (Lake Monticello and Lake Welsh) are also producing really well, so that gives us another option if the water on Lake Fork gets too cold. If you would like to come out to east Texas to get in on some of the action, I’d love to have you. Just shoot me an email, or give me a call or text, and we get something on the books. Be sure to set your DVR to record the next episode of The Outfitters Built by Ford Trucks airing on The Sportsman Channel (DirecTV channel 605) Sunday, October 9 at 11:00 a.m. ET, Monday (October 10) at 1:00 a.m. ET, and Tuesday (October 11) at 3:00 pm ET.